A grand night of happiness, when Prachun, a young businessman from the North was celebrating his wedding to Gorn Tong. However, his bride was not too happy and was sitting alone in her room. Sad for being forced into the marriage by her mother Lamai. This momentous occasion was disrupted when Intorn stole into the room and kidnapped Gorn Tong. 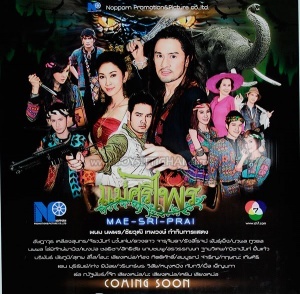 His friend Sang Plor and elephant Boun Choo burst in to pick up Intorn and Gorn Tong and fled into the darkness. Prachun was furious and set out to find the person who dared to step on his pride and kidnap his new bride. Meanwhile, Gorn Tong woke up to find herself sitting atop an elephant in a deep jungle. During the long journey, she was constantly harrassed and insulted by Intorn. She never knew why Intorn had kidnapped her to the Paso Village. The Paso Village was a Karen village deep in the mountains. Gorn Tong became a person of interest for everyone, all except Meuy Jiang, the pretty girl who was in love with Intorn. Meuy Jiang would find ways to pick on Gorn Tong in hopes that she would go away from the village. However, a kind girl named Alatae would always help out Gorn Tong. Intorn trusted Alatae to take care of Gorn Tong. Many times, Gorn Tong would wonder why the villagers loved and respected Intorn like a father. Time gave her the answer when she found out that Intorn helped the villagers by giving them farming techniques, medicine and teaching the children to read and write. This made Gorn Tong suspect that Intorn was definitely not an ordinary person. The time Gorn Tong spent in the village made her learn about the culture and customs of the villagers. The relationship between Gorn Tong and Intorn got better, Gorn Tong even started to forget about her life in the big city. The more they helped advance the village, the more the villagers loved both Gorn Tong and Intorn. This made Pasuay, a deliquint who wanted to be the village leader, very upset. Not only that, but he committed cruel acts. He kidnapped Masayong and raped her and then killed her love, Pajoe. Intorn was angry but didn’t want Pasuay’s vile blood to blemish the earth. Intorn banished Pasuay from the village. Pasuay vowed revenge and promised he would become the village leader despite the cost. Prachun and his group continued to search the forest, using Hunter Duang as their guide. One night, Prachun captured Pasuay’s gang who was now wandering the forest as theives. Pasuay begged for his life and bargained with Prachun that he would take him to Gorn Tong at the Paso Village. Gorn Tong decided to ask Intorn the reason why he kidnapped her. Intorn told her his painful past. Once he was getting married to his lover named Tubtim. However, before they spent the night together as husband and wife, Tubtim was raped by Prachun. Intorn unknowingly killed his lover and became a murderer. After that, he had to flee and become a mountainer to this very day. The story made Gorn Tong sympathize for Intorn. Prachun was able to reach the Paso village. Intorn didn’t want the villagers to attack because he knew the reason why Prachun had come. Intorn took Gorn Tong and fled to a nearby mountain that no one dared go into. Prachun was furious at the villagers for not telling him the truth. Out of anger, he burned many of the villager’s homes. The villagers took their anger out of Pa Suay for siding with the enemy. Prachun used the Paso Village as his headquarters for finding Intorn. Prachun met Alatae, who was now very sad because of Intorn’s leaving. Alatae’s kindness made Prachun admire her without knowing it. At the mountains, hardships made Intorn and Gorn Tong love each other more. At the moment when Intorn was going to confess his love to Gorn Tong, Prachun was able to break into their hiding place. Prachun was shocked to see Intorn. They both walked toward each other and the truth was revealed that Intorn was actually Prajate, Prachun’s brother that mysteriously disappeared. How will the love and revenge of these two brothers end? Stay tuned for “Mae Sri Prai” soon! This page was last modified on 29 May 2016, at 19:17.